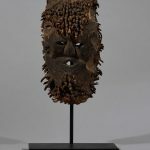 This antique Shamans Mask is made of bamboo-root collected from the Himalayan region. The ritual of wearing masks comes from animists Himalayan tribes used to worship spirits of nature and guardians of the grand mountains. The Shamans of these tribes used to wear masks during ritualistic performances in order to protect the village, heal diseases, practice exorcisms or other purposes. 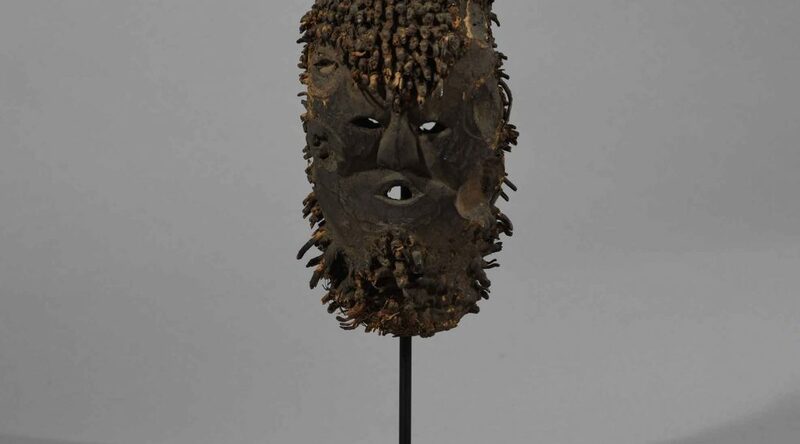 Masks supposedly had a very important functions in the social life of these community as they were used also during theatrical representations and ceremonies dedicated to ancestors. Age: Est. beg.- mid. 20th Century. Description: This is the first book dedicated exclusively to the subject of the Himalayan mask. Mysterious, sacred, and unusual, the masks of the Himalayas only recently arrived in the West. 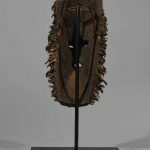 Unlike African or Oceanic masks, whose discovery by early twentieth-century artists altered the conception of art by their influence on Cubism, Himalayan masks only became accessible to collectors following the opening up of Nepal in the 1960s. Spanning all religious influences in the Himalayan region—Hindu and Buddhist, animist and shamanic—and covering the entire area from Ladakh to Indian Kashmir, Nepal, Bhutan, Arunachal Pradesh and Tibet, this is the first book dedicated exclusively to this subject.